MUSCAT 12 NOVEMBER 2014: Today Rally Royale received further excellent coverage in Oman’s main English-language broadsheet daily. 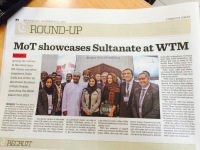 Times of Oman chose to pick up our story covering the World Travel Market. Read it here. Thanks to Times of Oman for making our story come to life.